There’s a new obsession in content marketing circles. It’s negatively affecting my reading experience and making it increasingly difficult to find the good stuff. What is this new kid on the block that’s messing things up? Much like infographics, listicles, and other hot content marketing trends before it, the original concept was brilliant. Its overuse and misuse are making it a menace. I encourage you to read the post by Brian Dean at Backlinko who is one of the good practitioners of this methodology. When I first read about skyscraper content, and the results it can produce, I have to admit I was excited and set about building it into my own content marketing planning. However, as someone frequently on the receiving end of skyscraper content because I am a heavy consumer of content marketing, social media, and SEO posts, it’s now making me think twice. The crux of my issue with so many blogs and businesses trying to outdo each other is that they seem to think skyscraper content is synonymous with length, not value. This may be a genuine misunderstanding. They’re using the number of words written as a proxy for value, something that people believe Google has been doing as well. And there’s some truth in this. It’s hard to deliver a ton of value in a post of 300 to 500 words (although not impossible). Writing 1,000 or 2,000 words typically gives you the ability to write with some depth and authority on a topic. Numerous supporting data points also show that longer content performs better across many key metrics. But skyscraper content isn’t just about producing longer and longer posts to rank above your competitors in Google. That’s an arms race that everyone ultimately loses. It ignores your unique strengths (or your content tilt) to focus on an easy-to-replicate, indefensible tactic of writing on a given subject. 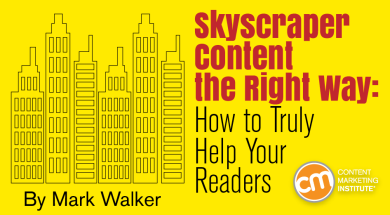 Creating skyscraper content that ignores true value ultimately leads to a poor reader experience. First, this content is written for search engines or to hit internally defined metrics, not for real readers. This content creation process leads to more poor decisions, such as padding posts with insufferably long, non-valuable introductions about the history of the keyword term. Or stuffing in a dozen oft-used quotes on the subject from other experts in the hope they’ll share the post; or adding in a ton of vaguely relevant stats to try to build authority. I’ve read several posts where I’m maybe a third of the way through (well over 1,000 words) and I still have not gotten to the first of the “10 tips.” The content creators were focused on bulking up the length and making it “comprehensive” at the expense of my sanity (and time). Another side-effect of conflating skyscraper content with super-long content is not making the tough decisions about what not to include. Actively excluding data points and fluff is a service to the reader, and a sign of a good writer. Don’t make me read all 10,000 words just to find the one original or useful concept — I shouldn’t be the editor of your content, you should! Unfortunately the crowds trying to create skyscraper content and focusing only on post length, will add everything they’ve ever come across in the name of “completeness” and to try to outdo their competitors. Finally, if you take a blog as a whole, where it almost exclusively posts skyscraper content, it becomes inaccessible. BuzzFeed balances out its click-bait listicle format with genuinely insightful long-form journalism; the Guardian offers a long read each day, alongside photo essays, commentary, and news; Content Marketing Institute offers podcasts, courses, guest posts, how-to articles, and opinion, creating an interesting blend of content that caters to different needs. Not everything will rank No. 1 on Google, but that’s OK because, taken as a whole, those top-ranking sites likely aren’t creating a compelling reader experience. This is one of the subtleties lost to those blindly following a single tactic like skyscraper content. Here’s another huge issue that is a symptom of bad skyscraper content — unoriginality. If your content marketing strategy is based on writing content about topics that already exist — and which to some extent have done their job well as evidenced by their success — then how will readers find anything new? How will new topics or angles be created? And how, exactly, are you adding real value? Again, this isn’t to disparage the methodology of skyscraper content. When done well, it actually forces you to find a unique angle to elevate the existing content and make it something entirely new and your own. This could be in format and presentation (for example, taking a really long post and turning it into an interactive chart that’s easier to digest; or taking a difficult subject that is written with dense text, and turning it into a much more accessible cartoon, SlideShare presentation, or video). Or it could be adding your own unique story, experiences, expertise, etc., to the original topic, meaning someone reading both the original and your skyscraper post would get unique value and understanding from both. However, too often I see skyscraper content that doesn’t add anything — other than more words — to the existing topic, and sometimes you see this happen several times from different competitors, leaving the reader with three or four “ultimate,” “complete,” or “definitive” guides to a topic that are substantially the same. As the owner of a company or a blog, adopting this strategy means you’re always going to be a follower, never original. Just because a poorly implemented skyscraper approach to content can lead to a poor reader experience doesn’t mean it can’t work when done well or in the right situations. Here are three ways I think it could — and should — be implemented. Unique angle – Creating nuanced content on a familiar topic is a great way to add something to the readers’ experience and teach them something new. Whether it’s a personal account of your own experiences, a dissenting viewpoint, or a genuinely new way to tackle an old problem, adding a fresh perspective is generally a good thing. Focus on value, not length – Remember that skyscraper content isn’t about creating content that’s longer than what exists. It’s about creating 10 times better (i.e., more-valuable) content. As referenced earlier, this could be done by taking a huge heap of text and making it much more accessible by turning it into a video or an interactive tool; or simplifying a complex subject by visualizing it. As with all great ideas that work, skyscraper content is powerful, but unfortunately that means it is widely misused too. And that’s a shame, because when employed properly, it can be a methodology of content creation that serves readers and businesses very well. The next time you think about writing that “definitive” guide that capitalizes on others’ successful content, ask yourself if it’s really needed (i.e., does it truly help your readers). If the answer isn’t a resounding “yes,” or you realize you’re only doing it for internal metrics, pause, and then go create something original that will delight your audience instead. Get the original content from which others may attempt to create skyscraper content. Subscribe to the free daily or weekly Content Marketing Institute e-newsletter. Mark Walker is an experienced B2B marketing leader and award winning content marketer. He’s a prolific blogger and speaker on all things digital, marketing, and content; and he loves to learn and connect with others interested in the trends shaping our future. Mark writes at swotnot, a blog that looks at the intersection of technology, marketing, and business. Connect with him on Twitter or LinkedIn.